Friday, December 4 marked the launch of the G20 Technical Platform on the Measurement and Reduction of Food Loss and Waste. The knowledge sharing platform—a joint effort between FAO and the International Food Policy Research Institute (IFPRI)—is meant to raise awareness and share best practices for measuring and reducing food waste and loss on a global level. Food loss refers to the decrease in edible food at the production, post-harvest and processing stages of the food chain, mostly in developing countries. Food waste refers to the disuse of edible foods at the retail and consumer levels, mostly in developed countries. Eliminating food loss and waste is critical to improving food security. More than one third of the food produced today is lost or wasted, and yet nearly 800 million people are suffering from chronic hunger. In order to feed the world by 2050, it is estimated that global food production must increase by 60 percent. Reducing food waste and loss will play a significant role in reaching this goal. Food wastage also has negative environmental impacts because of the water, land, energy and other natural resources used to produce food that no one consumes. This misuse of natural resources has repercussions on hunger and poverty alleviation, nutrition, income generation and economic growth. The financial costs of food wastage are substantial and amount to about US$1 trillion each year. Compared to other crops, pulses already have a low food wastage footprint, as illustrated in the chart below. FAO’s Food Wastage Footprint model (FWF) indicates that the contribution of pulses to total food wastage—including the carbon footprint and the blue water footprint—is low in all regions, making them an environmentally-friendly source of key nutrients. Pulses are also highly water efficient, especially in comparison to other sources of protein. For instance, one kilogram of cooked beef requires 10 times as much water than 1 kilogram of daal. Figure 1. 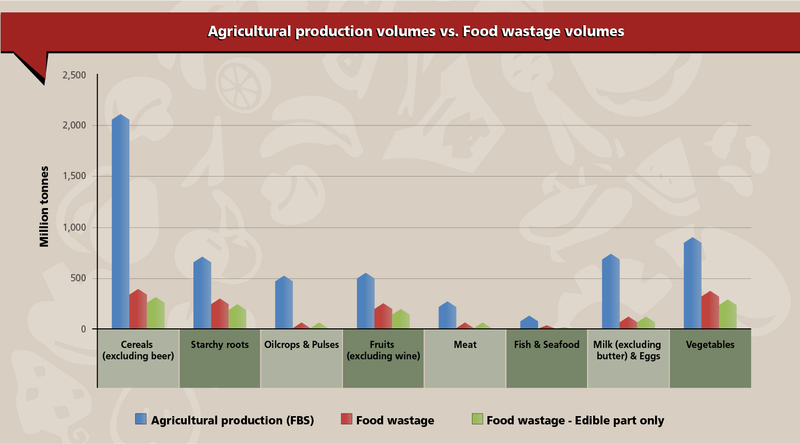 Total agricultural production (FBS) vs. food wastage volumes & food wastage volumes for edible part only. Pulses require minimal processing and no refrigeration, which limits natural resource consumption in the later stages of the food supply chain. Because they are shelf stable, pulses can be stored for many months and sometimes years without spoiling or losing nutritional value. This can reduce the likelihood of consumer food waste due to spoilage, and makes pulses a smart choice for food insecure households. However, overall production of pulses is currently lower than that of other commodities such as cereals, starchy roots and vegetables. One of the goals of the International Year of Pulses is to raise awareness about the benefits of pulses and encourage increased production and consumption of the crops, but this should be done concurrently with efforts to eliminate any food loss and waste from pulses production. Because of the magnitude and complexity of the problem, FAO recognizes the need to undertake action in partnership with other regional and international organizations, and with food chain actors ranging from herders, farmers and fishers to global companies. The Technical Platform on the Measurement and Reduction of Food Loss and Waste will help stakeholders communicate best practices to help eliminate food wastage and build a more sustainable food system.